What does Cage Fighting have to do with Karate? Cage fighting has more to do with Karate than you might think! Mixed Martial Arts is like science’s theory of everything, it brings all known unarmed fighting systems - grappling, striking, throwing etc together into one super hybrid. The idea is that the best rises to the top. So far it has - but some traditionalists think they can do without it. A lot of people involved in Japanese Karate make it clear that they don’t ‘rate’ mma fighters and they don’t like the idea of co-existing with them. But they only have to look back a few years to see that early traditional Karate was just as wild. Stories and images still exist of matches and dojo sparring bordering on barbaric. If you want to see a brawl, take a look at some of that. The fact is that Cage fighting like Karate both left brawling behind very early in their development. Cage fighters are now more than anything tacticians - and as a result most contests are a sight to behold. Anyone who thinks there’s no skill in cage fighting needs to take a good close look. Not only is it skillful, it offers the truest test of unarmed fighting skills there is. It has to do this - because it’s open to all comers. Competitive tension is built into mma training and competitive tension raises the bar that’s why mma fighters are so good. Karate has decided what Fighting is! By contrast, with a few exceptions, traditional Japanese Karate has been comfortably ‘self-referral’ for too long. By that we mean that it’s only measured against itself. It runs its own programs, names its own masters and devises its own combat applications. In effect Karate has decided for itself what fighting is. That’s very dangerous because modern combat has evolved dramatically and it’s not nearly as nice as it used to be! In one corner representing the ‘traditionalists’ stands a disciplined, orthodox Karate stylist, upright in his neat white dogi - ready and prepared - but apprehensive. Glaring menacingly across at him from the other corner, a crouching, near-naked cage fighter. He is looking for eye contact. He's pumped and ready to take the traditional guy down for the kill. Everything about these two is different - not just their appearance. One of them is about to get a wake up call. He comes from a formal, traditional school where ‘fighting’ is called something else, where most of the work is done against thin air - where order prevails. In his dojo he repeats the same techniques over and over against the same partners in the same place under the same conditions. If he passes a routine grading test which is 20% "combat" he progresses. Polite restraint limits what he can do to his ‘opponents’. In this sanitized, almost holy place, teachers discuss how moves that have been enshrined in martial exercises called Kata might work …! The other guy, like his cage fighting ‘school’, hasn’t been around long, but he works very hard with one thing in mind. Where he trains the culture is edgy, progressive, uninhibited - no neat rows of white suits here! Everyone is equal in the melting pot of mma training. He gets ahead on merit. It’s what he can do that counts - not what he knows. In contrast to what happens in a typical Japanese Karate dojo mma fighters take a very simple approach - they do something that is so obvious - yet absent in most traditional schools they train as they will fight. MMA fighters have come out of the shadows and literally turned martial arts tournaments upside down. Karate needs this wake up call because it is fast becoming irrelevant. We’re not talking about the sport of ‘non-contact’ Karate - that’s in quite good shape, pity it’s not an Olympic event (maybe more on that subject in another article) …we mean the side of Karate that produces "devastating abilities" but does little to measure how devastating. Traditional Karate should stop putting itself across as a superior combat system unless it stands up to the same scrutiny as cage fighting. Karate has conveniently lost sight of the fact that it is first and foremost a fighting art. By ignoring mma training and remaining closed to the probability that there’s something better out there it will quickly become insignificant. 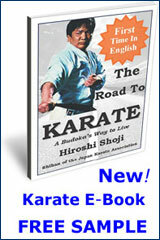 Does traditional Japanese Karate work? ...it could work a lot better. 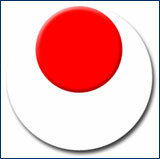 What about the main elements of Japanese Karate; Bunkai, Kata, Embu…are they still relevant? That’s for the traditionalists to work out. It’s up to the guys who practice this way to make sure everything they do leads to the outcomes they promise. ...and this is a message not just for Karate. The reality is that if a fighting art is untested, it will slip into the background and become pure art - minus the fighting. To be relevant, anything that purports to be a fighting system or to have a fighting system at its core must stand up to the highest scrutiny. Brazilian Jiu Jitsu did and easily passed the test. Royce Gracie and a string of other excellent BJJ cage fighters are living proof! Japanese Karate has a list of founders, grand masters, icons and champions that are already being overshadowed by new masters emerging from the ranks of cage fighting. To a man these guys have earned eveything they have including the respect of their peers. Karate talks an awful lot about respect - for you, your opponent and even for society. That’s great, but respect is not just an idea the best way of earning it in today’s martial arts is in a physical confrontation with an equal. Going hard against a guy hell bent on taking you out - win or lose - brings respect for the right reasons. 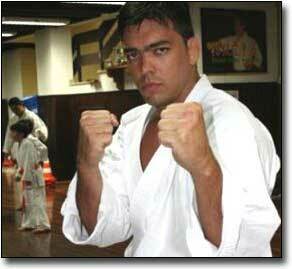 Brazil’s Lyoto Machida is a great example of a champion cage fighter. “The Dragon” comes from the most traditional of backgrounds. His father is a senior Sensei of the Japan Karate Association one of the largest traditional Japanese Karate groups in the world. Lyoto has made the quantum leap from the relative safety of the Shotokan Karate dojo to the chaos of top class cage fighting. And he has remained true to traditional ways. He is a living example of open minded thinking and you can bet his father is more than a heavy influence on him. Check him out, Machida is a gentleman and a credit to the noble arts. There are Karate people with a lot to say about MMA and its not all positive. But these guys don’t speak from experience they should follow the example of Lyoto Machida and loudly put up or quietly shut up. If Japanese Karate truly wants to benefit from the popularity of cage fighting it has to be prepared to put its stuff on the line like everyone else. Cage fighting is the best thing to come along since the Kung Fu Movie boom of the 1970’s. We are smack in the middle of the biggest Martial Arts boom ever ! This is a once-in-a-generation opportunity for all Martial Arts to grow. Only this time traditional Karate can’t sit back and bask in somebody else’s glory - it has to step up. The world is watching and you can't fool an informed public.